Here are some ideas of merch items you can make for $50 or less. Some of these have minimums some do not. 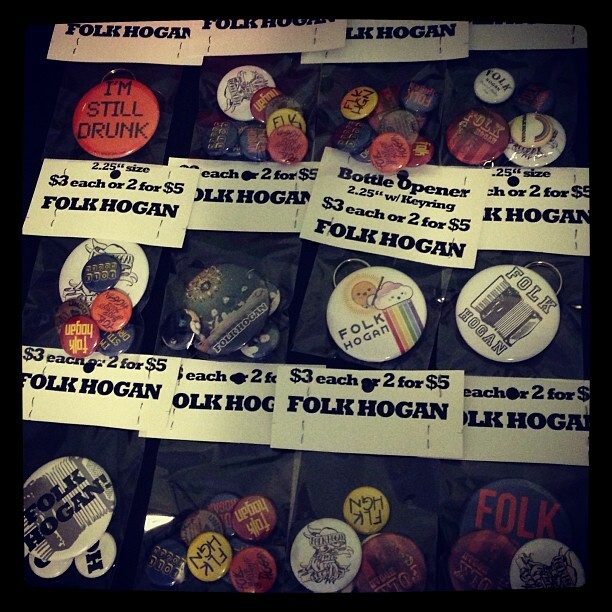 Full disclosure – I make buttons – so you should totally do that first. Some of these items are not the highest selling items but can provide value to your band anyways. Having your Name everywhere is a good thing and a lot of these items are good for product bundling. Buttons – pinback buttons, badges, pins, etc. regardless of what you call them they are a great item. Pros: inexpensive, no minimum order qty. for limited runs, look good on jackets and bags. Pros: Inexpensive, look good hanging in the band space. Can Koozies – Great for outdoor festivals and events in the summer. Bring these to the brewery you are playing! Cons: a minimum order will at times cost as much are large qty order on these. Guitar Picks – Custom guitar picks are less expensive than you may think! Formally reserved for only the rich and famous, now you can be neither and still have them – I’m living proof of this! Weed items** – maaaaaaaaaaaannnnnnnnnnnn. It takes a certain kind of band/crowd for these types of items. You can stick these tiny stickers on blank lighters, weed grinders, or blank rolling papers. Pros: Cures Cancer or something? Cons: none – why don’t you have these yet?!?! Need more help getting started? No problem! I can help you with that. Simply fill out the form below.